The first signs of cognitive decline among older adults are often memory-related. Forgetting a name, misplacing objects, or not remembering prior conversations becomes more common over the age of 50, sometimes leading to concerns that this forgetfulness is more than just normal aging. Known as subjective memory decline (SMD), researchers are asking if these episodes can be the early warning signs that a more thorough examination is needed. Back in 2014, Dr. Susanne Steinberg of Crozer-Keystone Health System, along with researchers from the University of Pennsylvania and Cogstate, designed a similar experiment to explore the link between memory complaints and performance on cognitive tests. 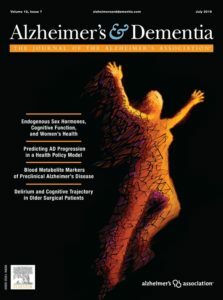 Measured over three years, Dr. Steinberg did find a statistically significant relationship between reports of more everyday memory issues and poor performance on the Cogstate Brief Battery, a set of computerized cognitive tests. In a recent study published in Alzheimer’s and Dementia, healthy older adults, over the age of 65, were asked about their own SMD history and then underwent neuropsychological testing as well as brain imaging to discover any correlation between SMD and emerging cognitive impairment. Researchers recruited 288 cognitively normal, older adults from the Australian Imaging, Biomarkers, and Lifestyle study. They were also interested in the predictive quality of SMD as a diagnostic marker for mild cognitive impairment or even preclinical Alzheimer’s disease. Test-Second Edition (CVLT-II). Visual episodic memory was measured using the Rey Complex Figure and the One Card Learning and One Back tests from Cogstate. Knowing that the presence of beta amyloid (Aβ) deposits in the brain are a consistent biomarker for preclinical Alzheimer’s disease, all participants had undergone positron emission tomography (PET) neuroimaging. At baseline, 58 participants exhibited high Aβ burden (Aβ+) and 230 had low Aβ burden (Aβ-). The MAC-Q questionnaire and the neuropsychological testing were repeated at 18, 36 and 54 months after baseline to track the relationship between SMD and cognitive performance. In addition, any addition of a clinical diagnosis of mild cognitive impairment (MCI) or Alzheimer’s disease (AD) over the 54 month timeline was noted as an endpoint. Results showed that those participants with high SMD and who were Aβ+ experienced a five times greater rate of progression to a diagnosed condition of MCI or AD than those who were Aβ+ but had low SMD.